Big Bungee Piranha's Lair is the eighth and final level of World 2 in Yoshi's Island DS where Big Bungee Piranha is the boss. It takes place inside of a sewer instead of a castle like all other final levels in every other world. Dizzy Dandies make their debut, as well as Wall Lakitus. 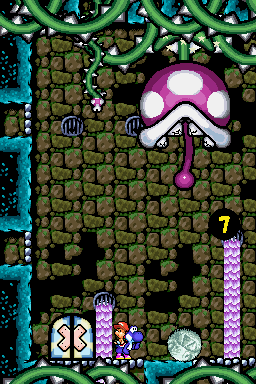 This level is similar to Super Mario World 2: Yoshi's Island's Naval Piranha's Castle. Yoshi starts the level in a rocky place with a Shy Guy-producing pipe nearby. He has to enter another pipe and appear in a sewer-like area with a multitude of switches. The player has to navigate through a switch network and continue on to the next area which houses a Stork Stop, an Egg Block, and a few enemies. After getting past another switch network, the Yoshi reaches an enemy-infested area which eventually leads him outside. The player has to reach the end of the area and use a Chomp Rock to be able to enter a nearby pipe. In this area, Yoshi has to repeatedly hit a Gobblin with eggs until it is defeated, allowing him passage to the next area. Here, Yoshi can find a Middle Ring and an Egg Block which are followed by a maze-like area filled with enemies. After that, the player finds a Middle Ring, a Stork Stop, and the boss door which leads to the fight with Big Bungee Piranha. Yoshi can defeat it by leading it to bite a Chomp Rock and then hitting its tongue with an egg. After this, he can continue on to World 3. German Big Bungee-Piranhas Röhrengarten "Big Bungee Piranha's Pipe Garden"